Jaguar will unveil its new supercharged sports car – the Jaguar XKR - next week, at the London Motor Show. 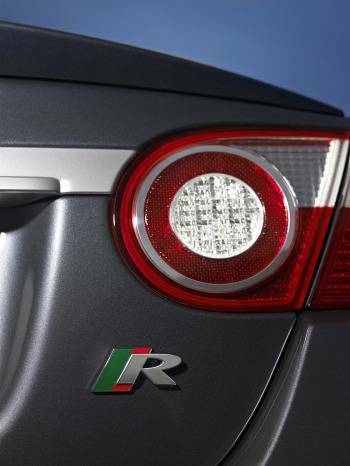 It will build on the XK range introduced in late 2005. Like the normally aspirated XK model, the new XKR makes use of practical, modern technology such as its aluminium monocoque body structure. In addition, an uprated 420 bhp (SAE) supercharged V8 engine and six-speed automatic transmission bring it a level of accessible, real-world performance that makes the XKR the most impressive, everyday, sporting GT in its class. And the XKR’s powerful statement of intent is reinforced by sporting styling cues such as a unique front bumper, aluminium-finish grilles and bonnet louvers; unique 19 and 20-inch alloy wheel designs and a quad-exhaust system add to its overall presence. "The new supercharged XKR captures perfectly the essence of what makes a Jaguar XK so special," commented Bibiana Boerio, Jaguar Cars managing director. "It is a flawless combination of refined Grand Tourer and serious performance sports car, that delivers a truly rewarding and exhilarating driving experience." Active Exhaust System to ensure cruising speed refinement but purposeful V8 roar under hard acceleration. The new 420bhp (SAE) Jaguar XKR is said to be a sensational car to drive. With 120 bhp (SAE) more power than the normally aspirated 4.2-litre XK, the same aluminium body structure that ensures superb ride and handling, and a six-speed automatic transmission with Jaguar Sequential Shift, Jaguar’s blend of performance and dynamics reaches new heights with the XKR. "Our aim when engineering the new XKR was to ensure that the car’s character remained balanced despite the significant increase in power over the normally aspirated XK," explains Jaguar’s chief engineer, Mike Cross. "Our engineering team worked to the brief of creating a car that is 120% and more of an XK – the ultimate sports GT for the real world. We wanted the performance and dynamism you would expect of an XKR but were careful to retain that exceptional blend of sporting luxury that every Jaguar must have and which was so convincingly demonstrated with the XK. The bottom line is: if you like the XK, you’ll absolutely love the new XKR." The result of that engineering brief is a car that performs in any conditions, at any speed. With superb torque at low engine speeds, instant acceleration is always available should you demand it. Similarly, the advanced steering and suspension set-up means the new XKR switches effortlessly from relaxed grand tourer to honed sports car with ease. It is everything the XK is and much more besides. The ability to call upon reserves of power and acceleration in an instant is the hallmark of every great Jaguar. 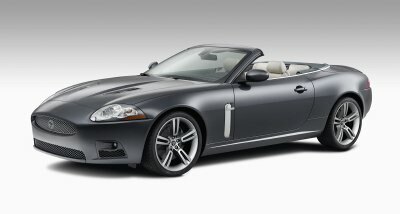 The new XKR ensures this by using a remarkable 4.2-litre supercharged AJ-V8 engine. Producing 420bhp (SAE) at 6250 rpm and 560 Nm (EEC) of torque at 4,000 rpm. The addition of a supercharger and twin air intakes means the new XKR benefits from a 120 bhp (SAE) power increase over the normally aspirated 4.2-litre XK with which it shares its engine configuration. Torque, so essential for instant acceleration at any engine speed, also increases significantly – by 36% over the XK, although the overall weight of the XKR is raised by just 70kg. Consequently the power-to-weight ratio compared to the normally aspirated 4.2-litre XK is an impressive 34% higher. And in comparison to the previous generation XKR, the new engine produces 7.7% more power and 3.3% more torque. Combined with the significantly stiffer and lighter aluminium monocoque body structure of the new XKR, these performance improvements lead to a significant leap in the power-to-weight ratio of 12% over the previous XKR and an equally useful jump of 7.7% in the torque-to-weight ratio. To achieve the equivalent improvements in power and torque-to-weight in the outgoing XKR would have required nearly 50 more horsepower. The heart of these significant performance improvements is the XKR’s lightweight eight-cylinder engine with an Eaton supercharger. The water-cooled cylinders are arranged in a 90-degree V configuration and the crankshaft is supported by five main bearings. Each of the two cylinder head assemblies incorporates twin camshafts operating four valves per cylinder. One of the reasons for the engine’s impressive output is the continuously variable valve timing which helps to deliver a wide spread of torque. The engine uses an Electronic Return-less Fuel System (ERFS) and a three-way catalyst exhaust system. The increase in power and torque over the outgoing XKR model is down to two significant additions to the engine. The air intake supply to the engine has been significantly enhanced thanks to the use of twin air inlets and a Variable Inlet Camshaft Timing system is used for the first time on the XKR. By continuously adjusting the timing of the inlet camshaft on both banks of the V8 depending on the engine speed and load, Jaguar’s engineers have ensured large improvements in torque, particularly at lower revs. The system is controlled by the Engine Management System (EMS) which receives engine speed, throttle position and oil temperature data from its sensors. The EMS determines the correct inlet camshaft timing by continuously referring to a digital three-dimensional map developed to provide optimum performance. The EMS then transmits the appropriate signals to two solenoids that control the degree of hydraulic force provided to the valve actuators. The normally aspirated 4.2-litre XK has been praised for its acoustic qualities, remaining unobtrusive and relaxed at modest speeds but producing an unmistakeable V8 soundtrack when worked hard. On the XKR, the presence of supercharger whine threatened to dominate the acoustic character and mask the underlying sound quality. However, through enhancements to the vehicle acoustic pack, the supercharger noise has been reduced by 5dB compared to the previous XKR. This approach to acoustics allowed the engineers to concentrate on using the exhaust system to deliver the best possible sound quality character. This was accomplished through the use of the XKR’s Active Exhaust system which varies the flow of exhaust gases through the main silencer box to ensure that the XKR remains quiet at cruising speeds but delivers a substantially more purposeful sound quality character under hard acceleration. Jaguar's Sequential Shift combines all the speed and involvement of a sequential manual gearbox with the comfort and convenience of a full automatic. The system consists of steering wheel-mounted paddles and a conventional gear selector lever, allowing the driver to switch between three automatic or paddle-operated gearbox modes. Whereas an automated manual gearbox interrupts the flow of torque during the gearchange – while the clutch is disengaged – the Jaguar's gearbox maintains the flow of torque throughout the shifting process. This results in gearchanges that are not only quick, but also remarkably smooth. Gearshifts are achieved in less than 600 milliseconds, from the point at which the driver operates the shift paddle to the point at which the shift is complete. In fact, during development, comparison tests between Jaguar Sequential Shift and rival automatic transmissions in the class showed the transmission to be the fastest system of all, changing gear at least 400 milliseconds faster than a standard automatic and 100 milliseconds faster than the best automated manual system. The three gearbox modes give the driver total flexibility to use the transmission to match whatever driving style he or she chooses. In Drive mode, the gearbox behaves as a conventional automatic, with the software optimised for every day driving conditions providing all the benefits of a best-in-class automatic transmission. In Sport mode, the gearbox's adaptive software becomes more prevalent, adapting and reacting more dynamically to demanding conditions. This software takes account of the prevailing conditions and driver's inputs and adapts accordingly. For example, it recognises when the car is negotiating a curve, and holds the gear accordingly; Hill Recognition enables the XKR to choose the ratios to optimise the ascent or descent of a hill; the gearbox’s software will also match the engine speed precisely to the engine and road speeds, ‘blipping’ the throttle during rapid downshifts. Manual mode is activated by simply operating one of the steering wheel-mounted paddles, and delivers a state-of-the-art manual gear shift feel from the automatic transmission. To ensure optimum ride and handling the XKR’s springs and dampers are uprated compared to the normally aspirated XK. The front spring rate is increased by 38% and the rear spring rate by 24%. Allied to the Servotronic steering system, which has also been tuned both mechanically and electronically to give the steering more weight and even greater response, the uprated suspension ensures confidence-inspiring handling without any loss in refinement and comfort levels. Because of the strength and stiffness of the chassis, the only significant addition to the XKR’s structure is an additional rear suspension brace mounted between the rear damper towers to accommodate the significant increase in rear spring rate. This also allows the Convertible to utilise the same dynamic settings as the Coupe model. As significant to the XKR as the increases in power and torque are the major improvements in strength and weight thanks to its advanced all-aluminium architecture. Unique in the industry as a complete aluminium monocoque body structure, as distinct from an aluminium spaceframe with separate aluminium exterior panels, its properties come from both the way the bodyshell is designed and constructed and the use of new joining technologies. In fact, the new XKR’s aluminium chassis is significantly lighter and stiffer in both Coupe and Convertible form than the steel model it replaces. The Coupe chassis is over 30 percent stiffer than the previous XK, while the Convertible is over 40 percent stiffer. As a consequence the XKR accelerates faster than the previous model, while offering high levels of safety, reduced noise and vibration intrusion, and improved ride and handling characteristics thanks to improved suspension dynamics. The new XKR Coupe is also stiffer and lighter than the Mercedes-Benz SL55 AMG, with a kerb weight of just 1,665 kg – some 290 kg less than the Mercedes. In Convertible form the BIW weight, at just 287 kg is 19 percent lighter than the previous XKR Convertible. New, larger ventilated brake discs at the front ensure higher braking performance for the XKR. The front brake disc diameter has increased from 326 mm to 355 mm and the thickness from 30 mm to 32 mm, which not only improves the braking performance but also the system’s resistance to fade. The braking system also includes four-channel ABS, Electronic Brake Force Distribution, Hydraulic Brake Assist to increase brake pressure during an emergency stop, and Jaguar’s Electronic Park Brake function. "We talk at Jaguar of how our new generation of models are ‘beautiful, fast cars’. It’s a phrase that ideally sums up our brand and can be applied to every car we design. We were extremely proud of the reaction to the new XK when it was unveiled last year – it is as beautiful as you would expect a Jaguar sports car to be. Now the new XKR has a look that emphasises the ‘fast’ aspect of our design statement. "The ‘powerline’ that runs from the front wheel through the cabin area and into the car’s rear haunches remains and we have added to that latent feeling of power by adding some strong performance features such as the louvres that signify the potent supercharger and the stunning new alloys that fill the wheel arches and give the car real purpose." The new XK’s interior design has been just as highly praised and the XKR’s cabin represents arguably the most sophisticated yet driver-focussed environment of any car in its class. The XKR has class-leading ergonomics, user-friendly in-car technology and simple, clear information displays in the instrument panel and main dashboard area. A unique sports seat design with additional lateral support for both the driver and front seat passenger has been added, with an ‘R’ badge on the headrestraints, tachometer, steering wheel and gear selector. The design of the standard aluminium interior veneer is also unique to the XKR, featuring a ‘weave’ pattern from the Advanced Lightweight Coupe showcar. Like the normally aspirated XK, the new XKR competes within the global sports car sector. In 1999 this sector accounted for just under 50,000 sales per year worldwide. Since that time the sector has doubled in size. The XKR will appeal to a select group of affluent potential customers, who have an affinity with luxury products. They are looking for a grand tourer as well as a car with pure sporting credentials; one that provides exhilaration and escapism combined with status and exclusivity – ‘luxury in a sports skin’. The new XKR, like all Jaguars, offers excellent value for money in the sports car market. The XKR ensures customers will enjoy a considerable increase in performance over the normally aspirated XK for a relatively small price premium. They will also benefit from a significant performance advantage over rivals such as the Mercedes-Benz SL500, which is slower and heavier than the XKR. Furthermore, the XKR offers a full suite of comfort, convenience and technology features, the large majority of which (such as satellite navigation, Bluetooth telephone, Touchscreen display and keyless start) are not standard on many rival cars of similar price, or even available at all. And because of its advanced lightweight body structure and powerful supercharged engine, the XKR’s performance even matches cars that are not direct competitors in terms of either price or technical specification. For example, it beats 5.0-litre BMW M6 on torque-to-weight ratio and virtually matches the 5.5-litre SL55 AMG on power-to-weight ratio. When the new XK range was unveiled in late 2005 it clearly pushed back the boundaries of sports motoring. Now the supercharged XKR extends those boundaries even further. The most potent of all Jaguar’s beautiful, fast cars, it straddles the gap between out-and-out performance supercars that struggle to cope with everyday use and more sedate grand tourers that are hampered by excess weight. Now, for the first time, customers can purchase a car which handles like a thoroughbred sports car, yet still offers levels of comfort, style and craftsmanship. And the new XKR also represents remarkable value for money, with a performance increase of over 25% in terms of power, yet an increase of just 12.5% in terms of price when compared to the normally aspirated 4.2-litre XK. Like every great Jaguar it combines beauty with power, and style with dynamism to deliver a world of performance and luxury that is quite simply exceptional.